Easeus Todo Backup Free is easy to use and integrates well with Windows. Simply double-click any Todo backup file, and it opens as if it were a folder. This allows you to easily browse and recover individual files and folders using Windows Explorer. There's a full integrated restore function as well if you prefer that approach. Easeus has improved the file selection dialog so that you may now drill down into folders in the right side pane for easier viewing. 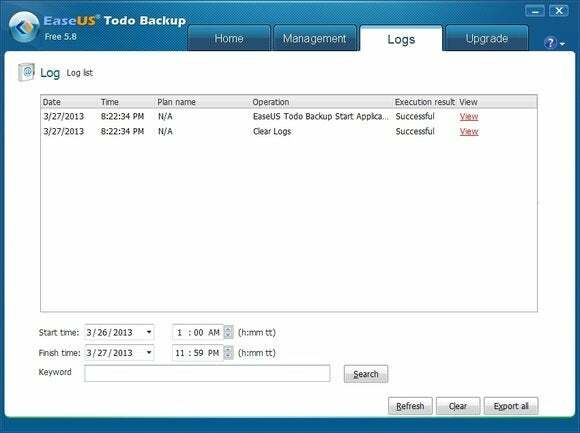 There's a separate Management tab so you can easily re-run and check on jobs as well as a Log tab that shows you when and how the backups went off. Easeus Todo Backup nicely displays the various drives and partitions on your system. Todo Backup Free's features include partition and drive imaging (both full and incremental), backup to optical, data wiping, drive and partition cloning, image culling, scheduling, and a pre-boot environment that installs to your boot drive so you can recover your system without using other media. Speaking of which, Todo Backup Free also creates a Linux-based boot recovery CD so you can recover your system if disaster strikes. Easeus Todo Backup is also available in a $29 Home version that adds differential backup, as well as dedicated Outlook backup and restore, system snapshots, a ready-made Windows PE boot disk ISO, and free tech support. For $10 more you can get the Workstation version that also supports dynamic disks, recovery to dissimilar hardware, and conversion of backups to virtual hard drives, as well as a license that allows business use. Todo Backup Free performed nicely in my hands-on, imaging and backup files with no hiccups. Backups were fast. However, the program does utilize four separate background processes and doesn't respond as quickly as it once did. I was also able to back up to a NAS box, including username and password entry, though the Web site lists this as only available on the Home version. 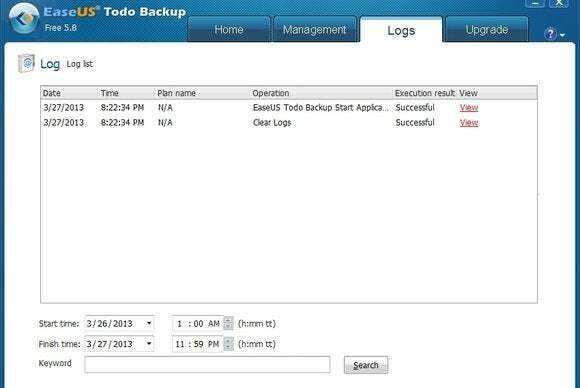 Todo Backup tells you which jobs and have run and whether they succeeded. Aside from a little advertising, there's little to complain about with the free version of Easeus Todo Backup 5.8. True, it's more of a resource gobbler than it once was, but even that's being a bit picky: It is free. If you need anything more on your home PC, your needs far exceed the norm. When it comes to free backup, you can't beat Todo's features.